If you like to read travel stories, you will like this book. If you like to travel, it has some destination ideas. If you wonder why some people never stop traveling and settle down, this book might provide some insight on that too! The trouble with over 30 years of traveling is being over 30 years older. But I can’t help it; I’m curious and the years flew. In my midlife review, I invite you to join me for the ride in TATTOO—JOURNEYS ON MY MIND. These 21 chapters share an eclectic mix of genres and places. Included is a canoe trip in South Carolina to set the fun tone of tree house to right; retracing how I lost my cultural empathy in Northern India; an unexpected lesson in team dynamics and self-empowerment while dog sledding in Minnesota, notes on wives being put out to pasture in the Utah desert; Eastern Europe’s sideways look into gulags; and a pair of caving trips that altered my view on the ground. These are the journeys on my mind. Click on TRAVELER’S TALES for the Table of Contents. Click on TRAVELER for author information. GET this paper book or e-book at Amazon.com and BarnesandNoble.com and Apple’s iBookstore. But to buy on Amazon outside the USA, click HERE. See book reviews on GOODREADS. 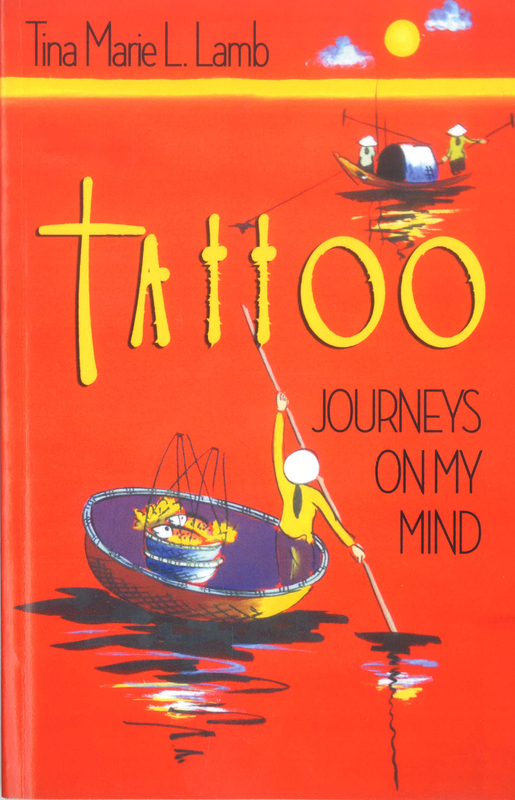 “Tattoo: Journeys on My Mind” is an excellent, vividly written travel memoir in which its narrator the many trips she’s taken in her life, most on a shoestring budget but still full of adventure and memories. As someone who is passionate about travel and seeing a lot of the world, this book was right up my alley! Each chapter in “Tattoo” is a story in itself about the author’s vacation to a wide range of destinations, which include both domestic and international locations. She writes about a canoe trip in South Carolina, a walking trip in southern Africa, exploring Mayan ruins, and ants in her rice in Thailand; there really don’t seem to be many corners of the world she hasn’t been! Each chapter is rich in description of not only her experiences in the country but also the scenery; she makes everything come alive, from the market stalls in Cairo to the desert in Utah. She also works in bits of trivia and history for each country as well (for instance, I didn’t know that the cat is missing from the zodiac calendar in China because it fell asleep—details like that make this a rich and entertaining read). 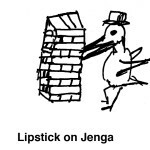 The vignettes are also very honest—not every thing in every country is great and magical, and the author writes with humor and wit about her experiences that were less than satisfying. “Refreshing read. I would put this book somewhere with Chicken Soup for the Soul kind of book. I liked her writing style and it was smooth to read. You could get to know the author through her stories. Sometimes people exaggerate stories but even in some o the more surprising situations, she makes it all sound so believable. I feel lucky that these worldly stories were shared.” Thank you! 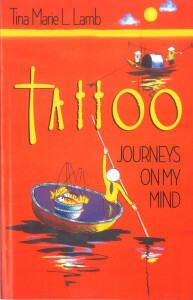 “Tattoo- Journeys on my Mind, by Tina Marie L. Lamb, is a book that the author wrote about her travels. Lamb reminisces about the different places and things that she did throughout the book, and its pleasant for both travelers and homebodies alike. Though the book reads as the authors memories of different countries and adventures, I felt that I as the reader got to see the author discover herself and who she really was. She describes herself as being timid and not at all adventurous, and then tells you a story of how she swam in the Nile river or how she pet a lion. To me, this is not something that a timid and non-adventurous person would do. “Tatoo: Journeys on My Mind was a fun and enlightening listen. I enjoyed hearing about Tina Marie’s journeys, and it was even narrated by her as well. If this was a mid-life crisis, it was an adventurous one. It would be a blast to travel and visit these awesome places during life’s prime. I did cringe a little at the ear cleaning in Viet Nam. SH wrote: Never a dull moment. “Tattoo – Journeys on my Mind by Tina Marie L. Lamb is a gorgeous collection of stories that the author describes as stories of her midlife crisis, beautifully written and gripping. The author takes readers through her adventures in life, involving a Carolina Tree House that harbors snakes and spiders, to being a captive to a Ganges River boatman and a lot more. These stories are the author’s adventures that allow her to come into contact with herself and to re-discover her zest for life. The stories are thrilling, filled with adventure, but what is interesting is that they are purposeful and each story unveils a layer of the authors/ narrators personality. “Tattoo – Journeys on My Mind by Tina Marie L. Lamb is a great mixture of life lessons hidden in variety of short exciting stories about places and people. The author shares some of the most emotional episodes of her life in order to makes us, readers open our eyes and to see the life beyond limits. There is a strong message in every single one of Tina Marie’s stories but the most important thing she wants us to see, feel and why not understand is how life does not control us – we control our life. With every decision we do will or make at some point we choose the direction our life will follow from now on.